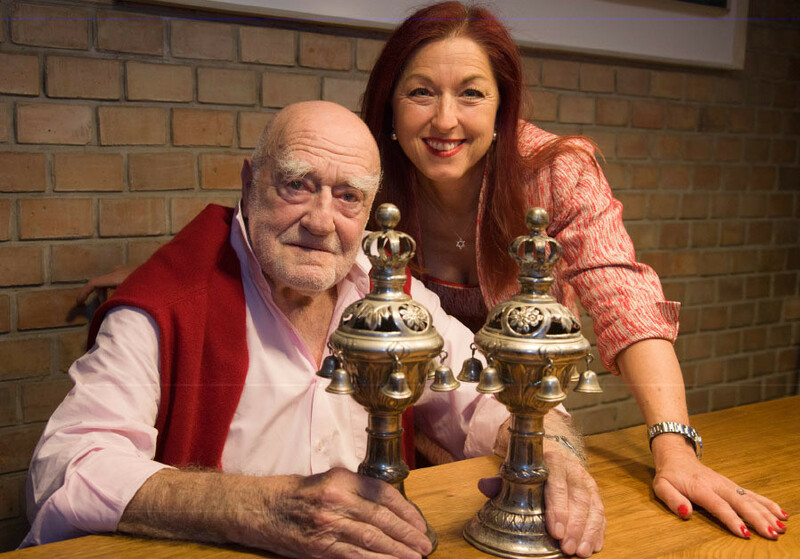 Hannah Lessing and her late father, internationally acclaimed photographer Erich Lessing, with the restituted Torah rimonim originally belonging to Erich’s cousin. As World War II finally came to a close, and the full horror of the Holocaust began to emerge, the focus was very much on the plight of the survivors and discovering who had perished. Millions of people of many races had been displaced from their homes. A large bulk of them were Jews, whose primary concern was personal survival, and looking for family members whom they may not have seen since before the war broke out. But in certain quarters over at the Allies’ end of the world, interest in the fate of works of art pillaged by the Germans was growing. It was not just a matter of tracking the works down – paintings, sculptures, Judaica and other artifacts that were among the most valuable in the Western world. It was also very much about restoring the art pieces to their rightful owners. Those efforts actually began before the end of the war, largely undertaken by the Monuments, Fine Arts and Archives program, also known as Monuments Men. The latter moniker may be familiar from the movie of that name, directed by and starring George Clooney in 2014. As we were informed at the recent The Future of Looted Art conference, organized by the Center of Organizations of Holocaust Survivors in Israel head Colette Avital, which took place at the Bible Lands Museum in Jerusalem, by and large, efforts to retrieve and return works to their original owners have gone pretty well over the years. All told, some five million works were stolen by the Nazis and around 600,000 – generally of lesser financial and artistic value – are still in ownership limbo. This was a high-caliber gathering attended by a stellar roll call of professionals from the relevant field. The speaker roster featured Prof. Monika Grütters, who, besides serving as Germany’s minister of state for culture and the media, also happens to be a bona fide art historian. Other speakers included Avital; Jewish Agency Chairman Isaac Herzog; Dr. Wesley Fisher, who serves as research director of the World Jewish Restitution Organization; senior curator of European art of the Israel Museum Shlomit Steinberg; and Vienna-based Hannah Lessing, who wears several related professional hats, including secretary-general of the National Fund for Victims of National Socialism of the Republic of Austria. Our own investment in returning looted artworks to the lawful owners was represented at the conference by Social Equality Minister Gila Gamliel. Culture and Sport Minister Miri Regev was conspicuous by her absence. One of the most intriguing slots in the seven- hour program was an address by Avraham Weber, a lawyer working at the Social Equality Ministry, titled “Twenty Years of the Washington Conference Principles – A Legal Survey.” The event took place in December 1998, and the 20th anniversary provided the temporal pretext for the Bibles Lands Museum conference. The Washington Conference on Holocaust- Era Assets set the ball rolling in a range of areas, with the summary document signed by 44 countries. While the principles were nonbinding, and the participants recognized that joint efforts in the field also had to take into account discrepancies between the legal systems in each country, the agreement stipulated a number of common tenets. These included identifying art confiscated by the Nazis and as yet to be restituted, and ensuring that relevant records and archives should be open and accessible to researchers, in accordance with the guidelines of the International Council on Archives. The international consensus also called for resources to be allocated for tracking down Nazi-looted artworks and returning them to their rightful owners. As the years pass, and the number of living Holocaust victims naturally decreases, the task of finding the owners, or the heirs thereof, becomes ever more complex. That was addressed by the Washington gathering, and the Conference Principles determined that “every effort should be made to publicize art that is found to have been confiscated by the Nazis and not subsequently restituted, in order to locate its prewar owners or their heirs.” That makes provenance research even more important, and local activity in that regard should receive a nudge when Shirit Keisin, who is responsible for museums and plastic arts at the Culture and Sport Ministry, initiates a course in that area sometime in 2019. Unfortunately, Keisin was unauthorized to enlighten me on the topic, but it looks like a step in the required direction. Meanwhile, the Germans, under Grütters, have been channeling financial resources and personnel to looking for, and researching, art looted by their predecessors. And not a moment too soon. Despite the positive intentions expressed in the Washington Conference Principles and at the subsequent Vilnius International Forum on Holocaust-Era Looted Cultural Assets, in 2000, and the 2009 Terezin Declaration following the Holocaust Era Assets Conference, held in Prague and Terezin under the auspices of the European Union, progress was relatively slow. Efforts to up the restitution ante received a powerful push when the discovery of the Gurlitt Collection came to light in 2013. The stash was discovered, in 2012, in an apartment in Schwabing, Munich, which was rented to Cornelius Gurlitt, son of celebrated art historian, dealer and war profiteer Hildebrand Gurlitt. Despite being removed from his post as director of an art museum in Zwickau, in eastern Germany, for exhibiting “degenerate art” in eastern Germany, Gurlitt Sr. was later appointed as a dealer for the Führermuseum in Linz, Austria, on the instructions of Reich minister of propaganda Joseph Goebbels. The trove contained over 1,400 works of art, including paintings by Chagall and Picasso. During her visit to Israel, Grütters signed an agreement with Gamliel which will see some of the works from the collection put on display at the Israel Museum next year. Even so, there are plenty of potholes in the road to be navigated, and it is becoming an increasingly bumpy ride. “Despite all that provenance research has accomplished in recent years, we still face unresolved questions and challenges,” Grütters continues. “One of these questions – which we will also discuss at this conference – is at what point do we consider the provenance of a cultural object impossible to clarify? When can one say that a cultural object is a ‘dormant asset’ and thus has no heirs? LESSING, WHOSE renowned photographer father lived in pre-state Palestine and fought in World War II with the British Army before returning to Vienna, took part in a panel discussion titled “The Future of Looted Art – Quo Vadis?” Lessing was joined by Claims Conference executive vice president Shlomo Gur and 86-year-old Dutch-born Holocaust survivor Abraham Roet. She noted that the National Fund for Victims of National Socialism of the Republic of Austria has been heavily involved in the restitution of looted art for 20 years. The fund also helped to promote the enactment, by the Austrian Parliament, of the groundbreaking 1998 Art Restitution Law. This paved the way for the restitution of looted works of art held in the Austrian Federal Museums and collections. This, says Lessing, “provided an explicit legal basis” for the return of artworks stolen by the Nazis to be returned to the legal owners, or their heirs. Looted works of art held in the Austrian Federal Museums and collections can be restituted by the competent federal minister if recommended by the Art Restitution Advisory Board, she explained. The said body convenes several times a year and, after reviewing the cases, issues recommendations. The Art Restitution Law also addressed the possibility of works remaining unclaimed, authorizing the National Fund to sell items for which no heirs could be traced, with the proceeds being used to benefit survivors. “In our experience, the most practical approach has proven to be the repurchase of the heirless items by the institutions, which, in return, pay the estimated value to the National Fund,” Lessing explained. The National Fund head gained some personal experience of looted artwork restitution a few years back, when the president of the Viennese Jewish community noted an interesting item in a catalogue of the Kedem Auction House in Jerusalem. The Judaica artifact in question was a pair of rimonim – Torah finials – bearing the inscription “Heinrich Lessing 1930.” It happened that the rimonim originally belonged to Lessing’s father’s cousin, and after $1,000 was paid to the seller, they were returned to Vienna. Kedem waived its commission. Lessing was keen to point out that selling off an artwork and using the proceeds to benefit Holocaust survivors “is always a last resort. Before the art objects are auctioned to raise funds for the victims, the National Fund endeavors to reach persons who are possibly entitled to restitution.” Those global efforts are made through various means, including an online art database (www.artrestitution.at) in cooperation with the federal museums and four provincial museums – in Vienna, Upper Austria, Styria and Tyrol – and a number of universities. Steinberg says that we, in particular her employers, are also doing our utmost to ensure that looted art goes back where it belongs. “In recent years the Israel Museum has done wonderful work in this area. We have restituted 30 works to the second and third generations. The great thing is that the activity is carried out by two volunteers, working with our registrar, Bareket Mann.” Such works would have found their way to the Israel Museum, and its predecessor the Bezalel National Museum, via the Jewish Restitution Successor Organization and the Jewish Cultural Reconstruction organization, which, inter alia, were created to distribute heirless and unclaimed property from World War II. The JCR was headed by none other than German-born Jewish American philosopher Hannah Arendt.